ZAROS, HERAKLION CRETE ON THE SLOPES OF MOUNT PSILORITIS AND THE ROUVAS GORGE. Zaros Village, Heraklion The pretty mountain village of Zaros in Heraklion, Crete, famed for its spring water, derives its name from two ancient Greek words "Za" and "Rous" meaning "much water flow'. 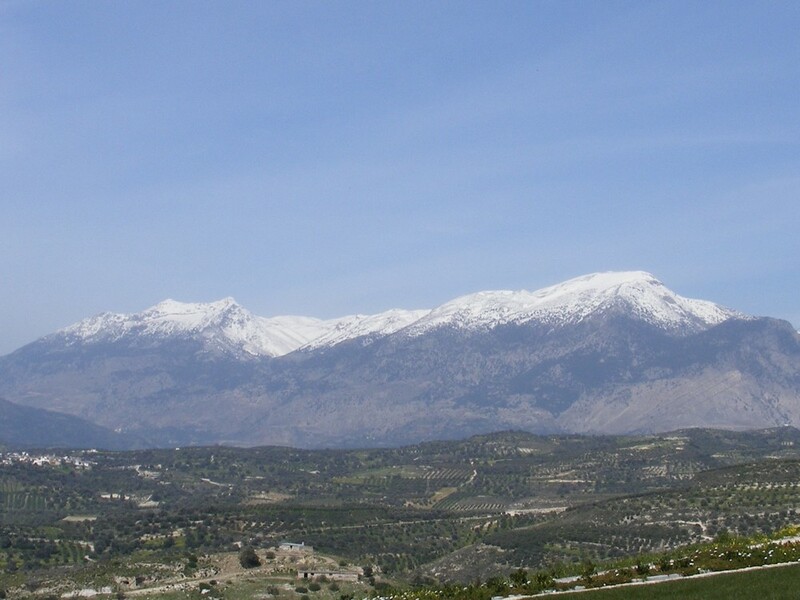 Zaros lies on the southern slopes of the Idi mountain range in central Crete with Mount Psiloritis as the highest mountain in Crete dominating the landscape. 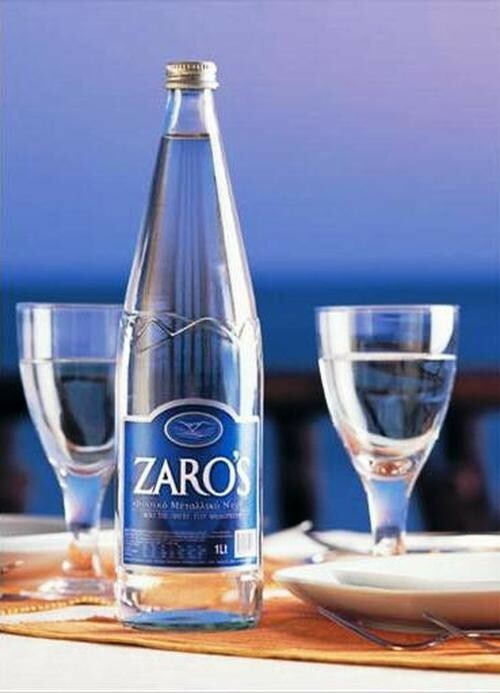 Zaros is renowned for its natural pure spring water. The natural springs of Zaros have been supplying the area with fresh, clean and pure drinking water for thousands of years. In the village of Zaros you can see the remains of the Roman aqueducts and ceramic water channels that supplied water to ancient Gortys. The water from the springs is also the water supply for the whole village of Zaros. So if you stay in the village you can take your morning shower in pure natural spring water! If you've visited Crete before you have doubtless seen the name Zaros on the bottled water you can buy. The natural mountain spring water of Zaros is bottled just above the village of Zaros and you can even visit the bottling plant owned by Votomos SA. 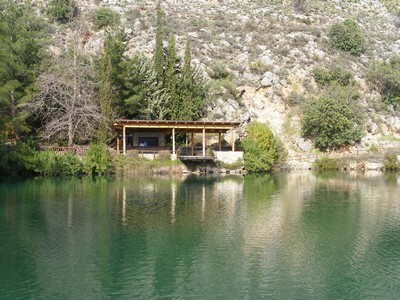 Because of the natural springs and vast amounts of water the area of Zaros remains green and lush even in midsummer and is a natural beauty spot for visitors. 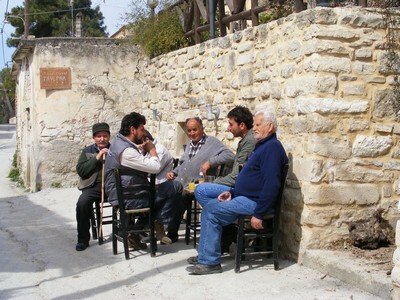 The village of Zaros at an altitude of 340m is home to around 2500 warm and hospitable Cretans and a few foreigners who love it so much they have set up home there. 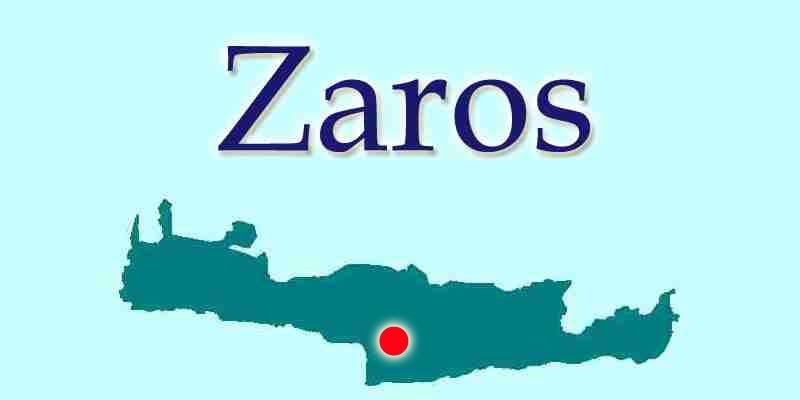 Zaros is located just 45k from Heraklion. Because of its central location in Crete, Zaros is the perfect place to base a holiday to explore most of the island of Crete. It's close to the fabulous south coast beaches of Matala, Kommos and Kalamaki and also to the ancient archaeological sites of Knossos, Phaestos, Gortyna and Agia Triada. Sprinkled liberally with many Byzantine churches and monasteries in and around Zaros, there are no shortage of places to visit. 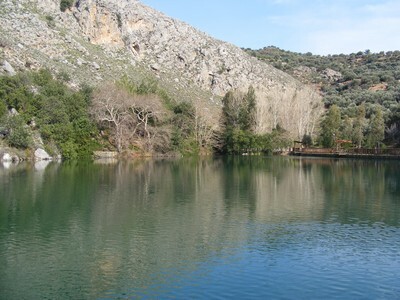 The pretty Lake Votomos in Zaros, surrounded by olive trees and carob trees makes the perfect picnic setting with ducks and geese to feed your excess lunch to. There's also the newly built Fragma or dam and reservoir found below Kato Zaros which has attracted many water birds including hundreds of coots and moorhens. It is quite a spectacular site as the water has covered a valley that was filled with olive trees, almond trees and even an old Byzantine church. You can still see the tops of olive trees growing in the water! There is also the fabulous Zacharioudakis Winery nearby which welcomes visitors to tour the vineyards, winery and sample the excellent wines. 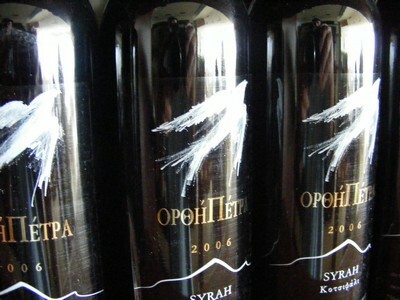 They produce four fabulous wines – three red and one white from the nearby vineyards. 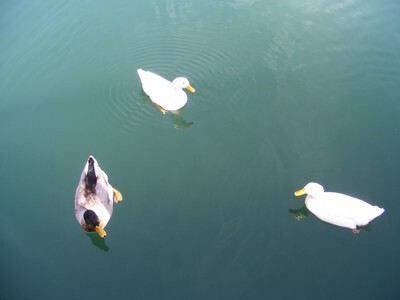 The winery also arranges traditional grape treading for visitors. But don't worry the resulting grape juice is not used to create the superb wines offered by the winery. The spacious and sumptuous restaurant and wine tasting area has panoramic views of the Idi Mountain range as well as the majestic Mt. 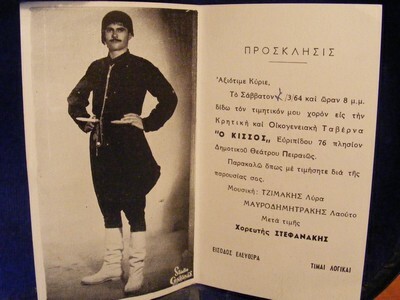 Psiloritis. On Sundays a full high class restaurant service is available accompanied by the excellent wines the winery produces. During the week wine tasting accompanied by tasty Cretan snacks make for the perfect afternoon. 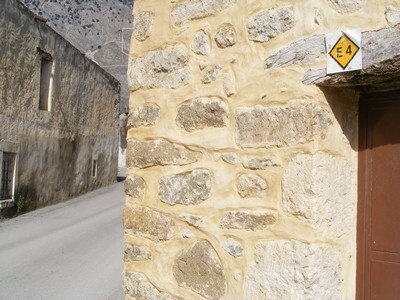 Hikers, walkers and E4 European Path trekkers will find an abundance of scenic walks including the Rouvas Gorge known also as Zaros Gorge in and around Zaros. The Rouvas Gorge leads to the protected Rouvas Forest which is the oldest oak forest on Crete. 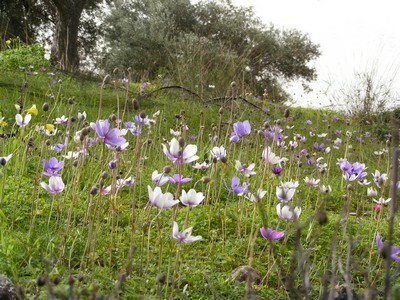 The breathtaking scenery of Zaros is enhanced by the many beautiful and colourful flowers, especially at springtime. 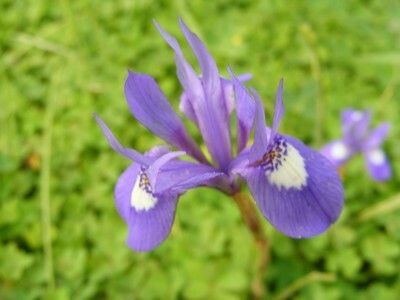 Rare orchids, fields of purple anemones, red poppies and violet irises can all be found in abundance in and around Zaros and are the perfect subject matter for keen photographers and artists. The hillsides are covered by wild herbs that add a fragrant aroma to the whole area around Zaros. We were told that two eagles have their home above the Rouvas Gorge too. The village itself has a number of small shops including a folk craft shop selling traditional embroideries and colourful woven goods. The friendly lady owner will demonstrate traditional crafts for you too. A wonderful music shop owned by the musician and instrument maker Antonis Stefanakis sells traditional Cretan and Greek musical instruments. There are also craftsmen, artists and icon painters in the village. The gorgeous Lavender shop is also in Zaros and sells herbs, honey, olive oil and other traditional Cretan products with a vast array of goods to tempt the visitor. Zaros has a number of accommodation options. 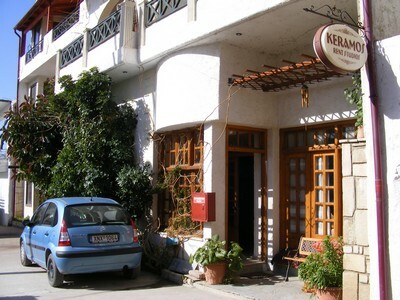 One of the very best places to stay in Zaros is the homely, welcoming and traditional Hotel Studios Keramos. 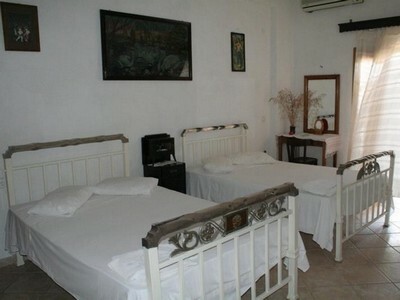 Here you'll find genuine Cretan hospitality with clean, traditionally furnished comfortable rooms. 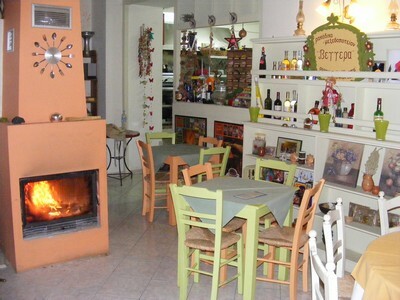 The Hotel Studios Keramos is a traditional family guesthouse or B&B. The owner Katerina, is famed for her huge homemade breakfast. She uses produce fresh from her own farm and garden. 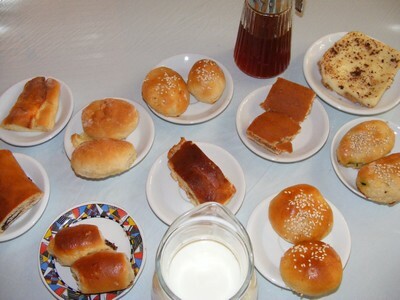 A vast array of traditional Cretan pastries, breads and famous cheese pies are accompanied by homemade goats cheese, fresh farm milk and eggs collected that morning make up the breakfast and is accompanied by a choice of freshly brewed Greek coffee or Cretan mountain tea. In contrast to the traditional Cretan rooms of Keramos you can stay in the ultra modern, airy and fully equipped Nana Apartments with spectacular views of to the Idi Mountain range and Mount Psiloritis. The word 'apartment' doesn't do them justice as they are more like bungalows or large chalets. There are just five bungalows that make up the Nana Apartments complex, so you never feel overcrowded. The individual apartments are spacious and are ideal for families or groups. At Nana Apartments you also have the opportunity to enjoy traditional Cretan evenings accompanied by music played by the owner himself. 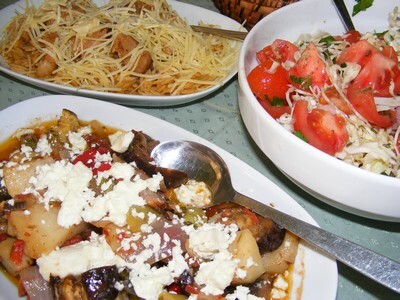 For the very best real Cretan food you will not find better than the delicious and wide ranging dishes offered at the Vegerra Taverna in the heart of Zaros village. Although not solely a vegetarian restaurant the Vegerra Taverna does have more vegetarian dishes than the typical Greek taverna. Whether you are vegetarian or a meat eater you will find a variety of mouth-watering dishes, all home cooked, organic and perfectly presented at very reasonable prices. The Vegerra Taverna probably offers the best range of vegetarian and vegan dishes anywhere in Crete. Another fine restaurant and the only place to sample fresh trout and salmon on the entire island of Crete is the Votomos Taverna in Zaros. Here you can enjoy fresh fish, the stunning scenery and the warmth and generous spirit of the owner, George and his staff. Yammas! We love Zaros and would encourage visitors to explore the beauties of this fabulous village. 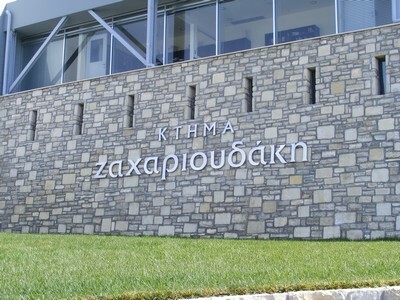 The newly built Zacharioudakis Winery is within easy distance of Zaros and is well worth a visit. 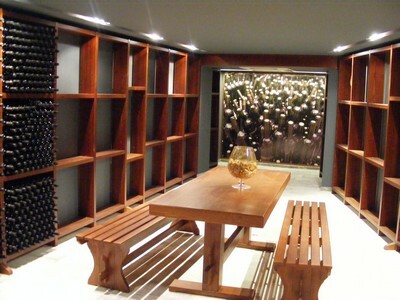 Both the vineyard and the ultra modern winery are open to the public all year round - Tuesday - Sunday 10.00am – 18.00pm. A guided tour of the winery is both fascinating and very informative. The natural beauty in and around Zaros is simply stunning and of such a wide variety. Easily accessible beautiful south coast beaches like Matala, Kommos and Kalamaki are close to Zaros. You can also drive to the picturesque coastal resort of Agia Galini. The Rouvas Gorge is a natural attraction as are the pretty Lake Votomos in Zaros and the bigger Fragma close by. The Hotel Studios Keramos is renowned for its comfortable and traditionally furnished rooms. All rooms have central heating, air conditioning, TV and shower with WC. The Hotel Keramos is open throughout the year and a roaring log fire is lit during the winter months in the breakfast area. There are plenty of options for sightseeing in and around Zaros. The archaeological sites of Knossos, Phaestos, Gortyna and Agia Triada are all within easy reach. The area has plenty of old churches in and around Zaros and there are a number of monasteries open to the public including the very impressive monastery of Agios Nikolaos and the Monastary of Agios Fanourios, the earliest religious painting school in Crete that 'El Greco' Dominikos Theotokopolous was reputed to have attended. The Vegerra Taverna in Zaros is a little restaurant with a great big heart. Warm, welcoming and with the most excellent food, this restaurant is truly exceptional. A varied menu of totally organic and mainly vegetarian dishes are served daily. Votomos Taverna in Zaros is a lovely traditional Taverna that is the one and only place that serves fresh trout and salmon on the entire island of Crete. It is set in beautiful surroundings and is open all year round - just weekends in the winter months and every day the rest of the year. 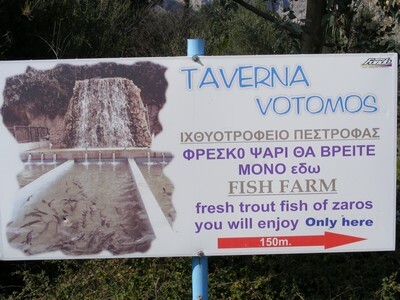 Visit Votomos Taverna to have the opportunity to have fresh trout or salmon in wonderful surroundings. 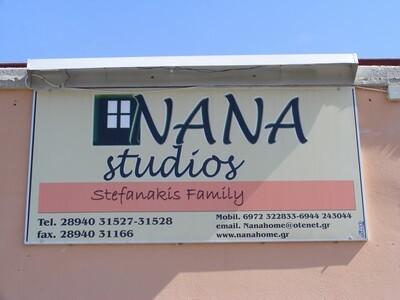 The Nana Apartments in Zaros are perfect for families as each individual spacious apartment has two double bedrooms, a fully equipped kitchen, central heating and its own patio and yard. Along with fragrant herbs, herbal teas, olive oil and honey, Zaros has some outstanding artists, craftsmen and traditional folk art artisans, happy to sell their wares to visitors to the village. Exquisite hand painted Icons, handmade traditional Cretan and Greek musical instruments and handmade embroidered linens and woven goods are all available in Zaros. It is a great place to really find some fine handmade products at very good prices.